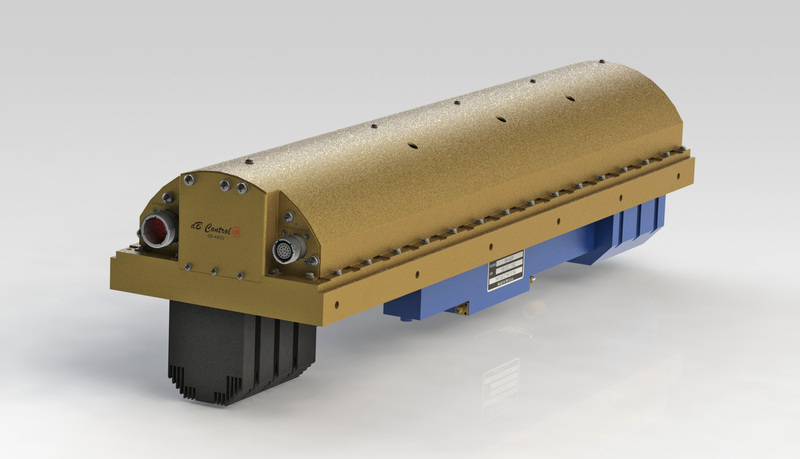 Compact, low weight dB-4409 TWTA designed for electronic countermeasure systems, electronic threat simulators and multi-band communication xystems onboard military airborne platforms. Our new dB-4409 TWTA is designed to address both current and future EW threats. Combining the bandwidth of 2-18 GHz into one high-power product gives tremendous benefits to the ECM system designer. dB Control Corp., an established manufacturer known for its reliable, high-power microwave amplifiers, radar/electronic countermeasure (ECM) transmitters and power supplies, is introducing the Model dB-4409, a pod-mounted, dual-band Traveling Wave Tube Amplifier (TWTA) in a single, self-contained package. The TWTA provides 300 Watts of continuous wave power and operates in the 2-18 GHz frequency range with fast switching between two standard bands (2-8 GHz and 7.5-18 GHz). Custom frequency bands are also available. ECM systems, EW threat simulators and multi-band communication systems use complex radar waveforms with multiple modulation schemes, pulse patterns and pulse bursts. The high power amplifiers used for amplifying these signals need a high level of RF power with a wide bandwidth, extremely low phase noise, excellent amplitude, phase stability, pulse burst in the megahertz range and an RF pulse width of one microsecond to several milliseconds. The dB-4409 TWTA operates at altitudes of up to 55,000 feet and at temperatures between -40* to 70*C. The TWTA is ruggedized to withstand humidity, vibration and shock. Periodic permanent magnet (PPM)-focused, conduction-cooled TWTs are used for power amplification. The high-voltage power supply section uses modular architecture and low-noise power supply topology utilizing high-efficiency solid state power conversion circuits. Established in 1990, dB Control Corp., a subsidiary of the Electronic Technologies Group (ETG) of HEICO Corp., supplies mission-critical, often sole-source, products worldwide to military organizations, as well as to major defense contractors and commercial manufacturers. dB Control designs and manufactures reliable high-power TWT amplifiers (TWTAs), microwave power modules (MPMs), transmitters, power supplies and modulators for radar, electronic countermeasure (ECM), communication and instrumentation applications. In addition to these core products, dB Control also has an outstanding record of successfully repairing, refurbishing and replacing tightly packaged high-voltage transformers, assemblies and power supplies and offers specialized contract manufacturing services, including transformer winding and testing, full-vacuum encapsulation, pressure cure and conformal coating laboratory services. Email vanessa(at)c3PR(dot)com for photos, logos and graphics.